A dastardly darkness has targeted innocent people in Nice, France. They were watching the fireworks in remembrance of the Bastille Day, an honorable day for the revolution that was, alas, going to be hijacked by the bourgeois class later. Or they were just taking a stroll, an act that has been forbidden for many cities of the Middle East for long. Are the questions ‘How many?’, ‘How old?’, ‘What nationality?’, etc. important now? Politicians of states have already repeated the same old clichés that this was a heinous and horrific attack, that perpetrator(s) are the enemy of humanity, and that they will avenge this treacherous act etc. The journalists have tried to talk to the eye witnesses who have been traumatized by what they had seen and heard. Millions have shared videos of the moments in which the truck has become a death machine that crushed people to death. We had almost got used to shootings , stabbings, and bombings. But now the trucks too have become deadly weapons. What else? What unexpected ends do wait for hundreds or thousands? Will the people be able to look at the things that move around without suspicion from now on? The darkness seems to have terrorized millions irreversibly. But what about those who are fighting against the darkness? They are sending their revolutionary greetings and their condolences to the people of Nice. They try to tear the darkness apart from streets to streets and from the buildings to buildings. Their best answer to the darkness is to intensify the dignified fight against it. Because they know very well that to live is to resist. YPG International is an official information portal for the Rojava Revolution and People’s Defense Units (YPG) made by YPG. We provide first hand information for everyone who is interested in our struggle, in people’s revolution of Rojava, in Kurdistan and in a democratic Syria. YPG International is the international path to the Rojava Revolution, the official path to support YPG in Rojava. YPG strives for a democratic, ecologic, and anti-patriarchal system of self-organisation; it takes its power from the people and fight for the people. We struggle to defend the dignity of being a human when there is no one around to defend it and to create an ethico-political society in order to realize ideals of equality, justice, freedom, and self-determination. We wage a war against all forms of fascism and capitalist hegemony that try to enslave the peoples and destroy the nature. We get our inspiration from the philosophy of Abdullah Ocalan whose ideas have become a torch in the jungle of oppression for the poor and the downtrodden; not only in Kurdistan but also in all around the world. For dignity, solidarity, freedom – American fighters of Lions of Rojava. Death to the terrorists of Islamic-fascism – Total liberation. Paul Z. Simons, also known as El Errante, is interviewed by rydra on his recent trip to Rojava. Paul tells stories of his trip, relays discussions he had with people in Rojava in the YPG, YPJ, taxi drivers, translators, and more. Paul describes the situation in Rojava as a “post-leftist revolution in a pre-leftist society.” Paul also tells us how he got into the country, how others can, and why he feels that what is going there is important to anarchists all around the world. 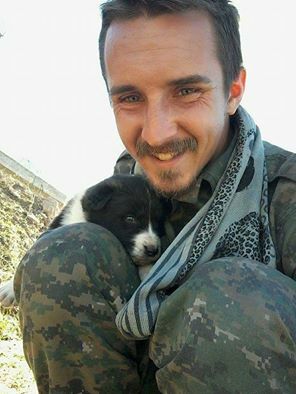 John Gallagher, the Canadian volunteer YPG fighter, is an internationalist hero who gave his life for a noble cause. He left behind a grieving family, and a world in gratitude for his bravery and sacrifice. First, let me get the obvious out of the way: I do not expect anyone to agree that it is a wise course of action to volunteer to fight against ISIS. Would-be terrorists from all over the world, including Canada, (including some I probably went to school with,) are flooding into the Middle East by the thousands. They’ve got the numbers and the weapons to win this war, so to go stand on the other side of the battlefield is objectively insane. I also respect the viewpoint that the last thing any westerners ought to do is get involved in another Middle Eastern conflict. We’ve already done tremendous damage to the region; the rise of ISIS is a direct result of foreign policy blunders by the last two Presidents (at least!). If you think that for the good of the region we should all sit this one out, I can understand that. But I can’t agree. YPG/YPJ on the Al-Hawl front are clearing 400+ IEDS on the frontline placed by ISIS gangs, after taking control of the area. The comrades are reported to be 4km from Al-Hawl and advancing from 2 sides.